And the final installment of this rather long trip report! On the way to the Ruunaa Hiking Area we stopped in a small village, where we shopped some groceries - that means German Bratwurst, bananas, apples and more chocolate for me! After this brief stint into civilization we continue to the next basecamp, the Siikakosi parking and fire site at the end of the Ruunaa river. The site was "meh" in regards to "Great places to pitch" but I found a halfway decent site with a nice view on the river, even though the wind was blowing mighty fine where I was located. The evening exercise was to scout the two last rapids which we would run tomorrow. Now Jongunjoki was a small river, and Ruunaa was quite a different ballgame. A good thirty or more meters across, deep and fast this was a big river, and so where its rapids. 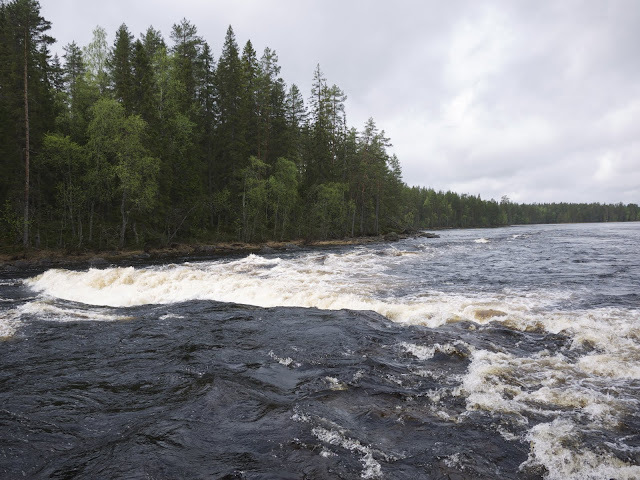 The last rapid was Siikakoski, a mere Class I - but because of its 1,2 km length, and being right after the Class II Murrookoski, quite different from the Class I rapids on Jongunjoki. 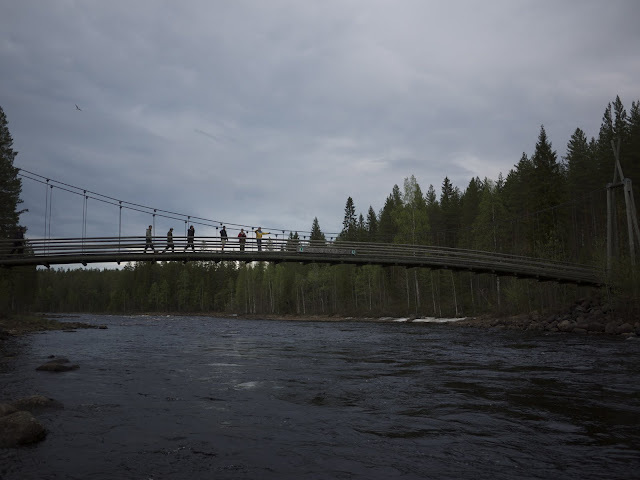 Siikakoski bridge. In the Ruunaa Hiking area there were plenty of bridges for walkers to cross the river on dry feet. 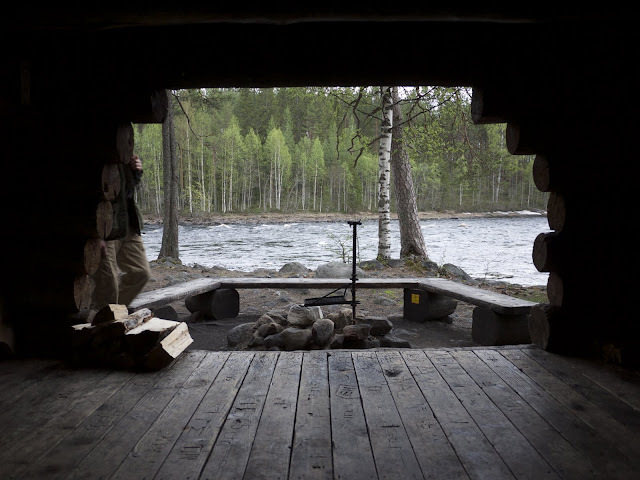 One of the surely dozens of laavus along the river, a fine view and great soundscape. Fishermen will love the installed smoke ovens where you can smoke your freshly caught trout and grayling! Tuesday, a full day paddling on Ruunaa. 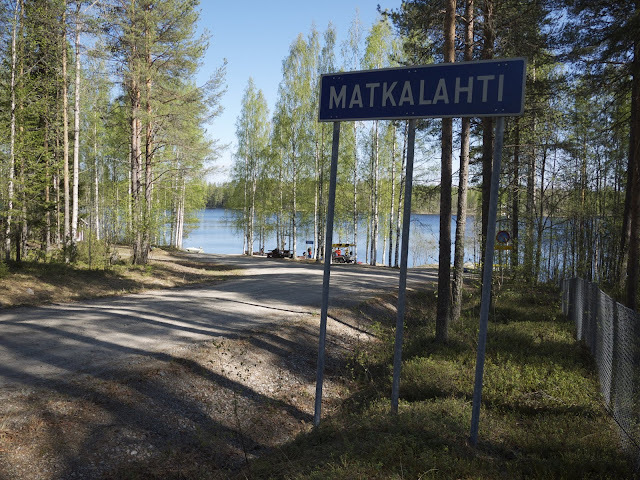 Wake up early, breakfast, pack the belongings needed for the day, hop on the car and drive up to Matkalahti. While we unpack and load the canoes and kayaks, and generally lounge in the sun, the cars depart back to camp and one comes back. A lot later than expected we start, happily the weather is brilliant, warm sunshine makes paddling a bliss and even makes the strong headwind less of a problem - at least on the first stretch. 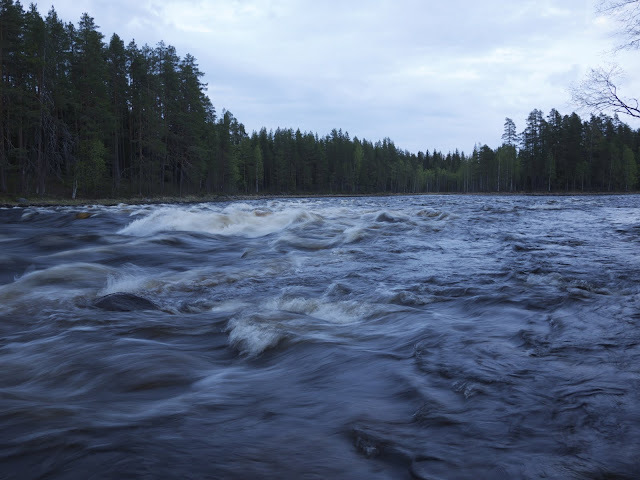 Haapavitja was the first serious rapid that day, Class II, some two or three very deep haystacks, big rocks, more haystacks, several hundred meters long. Being with someone in a canoe I haven't paddled with before, this was a serious test for our teamwork. Despite some very different approaches (I was the bow paddler, my preferred position in a canoe) we managed to go down the rapid without capsizing, despite going sideways into the haystacks. Some miraculous saves on both ends were likely responsible for that, and down the rapid we went to collect the canoe of some classmates which were less lucky. 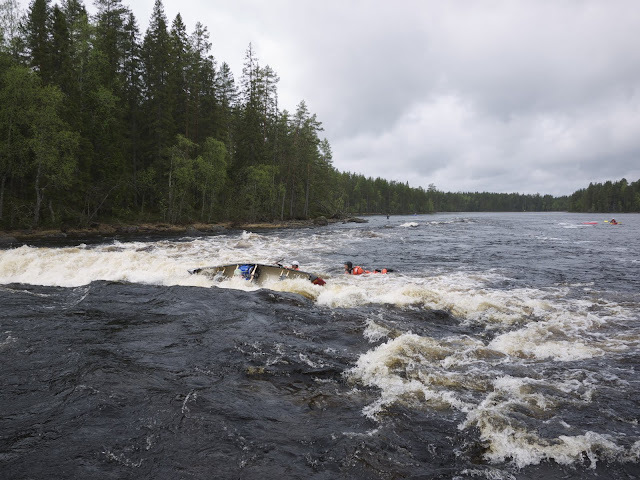 As we had two capsizes at this rapid, and it already being fairly late, we had lunch at the Korpiniemi laavu before continuing. 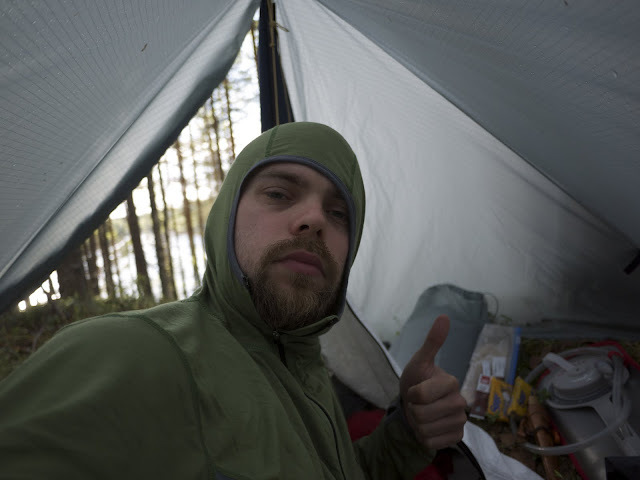 The wind picked up, and our traverse of the Neitijärvi lake was quite strenuous despite trying to stay in the wind-sheltered side of the lake. 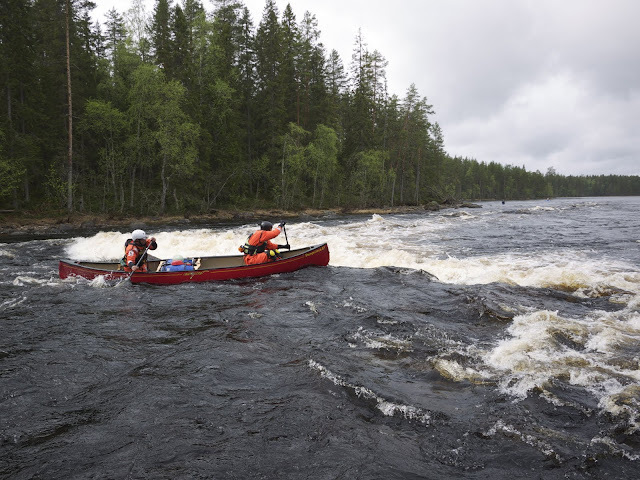 After a good hour of paddling into the headwind we reached the Neitikoski rapid, Class II that day due to the "low" water. A big stopper wave right there in the middle, followed by some deep haystacks. Kayaks were to go first, with canoes to follow, one at a time. Daily leader in kayak: Pass. Petri: Pass. Teacher: capsize. Next kayak: capsize. First canoe: capsize. 2nd canoe: capsize (that was us). Third canoe: capsize. Fourth canoe: Pass! (That were our two 50 year old ladies - really awesome =). Final kayak: capsize. What a ride. The key success is simple: Either go full power forward for the stopper wave and paddle like a madman (or woman!) to get over it, or backwards ferry-glide on the right side of the deep stream in order to go down the right, easy side, bypassing the stopper wave. The latter was our plan, but our communication and different paddling techniques made short work of that plan - the main stream picked us and all I said was "Full power forwards" with my stern paddler saying "wtf? Oh no..." as we went diagonal for the stopper wave. For a moment it looked like we could make it over it, and possibly we were, but then we tipped backwards and took a bath in the cold stream, holding on to our paddles and canoe. Petri was there right away to tow our canoe, and us holding on to it, to the nearest shore. From there we saw how the other canoes and kayaks, one for one, capsized and were rescued. Our two ladies, who made it through, reported that they were sitting nearly knee-deep in water and that there wasn't much space left and they also would have capsized. But as it were, they were the only ones who made it through in a canoe - Congratulations again on this way! 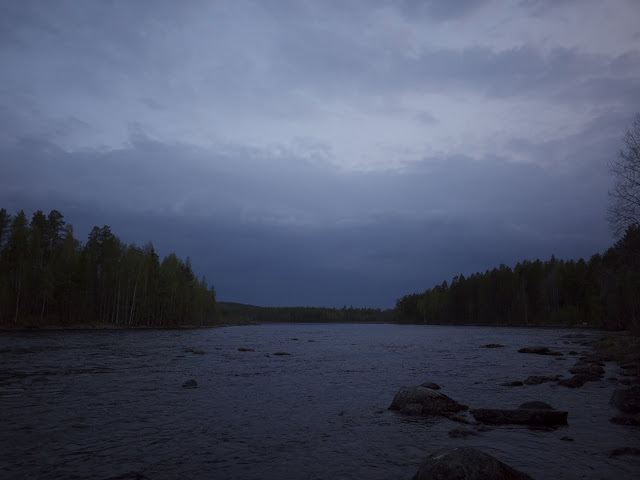 As nearly 80% of the class and a teacher took a dip, we stopped at the laavu not far away from the rapid, lighted a fire and dried ourselves. I grabbed some nuts, dried fruits and a Snickers Bar I had saved just for such an occasion (!) to warm myself up from the inside, while drying out my clothes by the fire. But we only had come half way, so soon we continued, over another lake into the headwind. 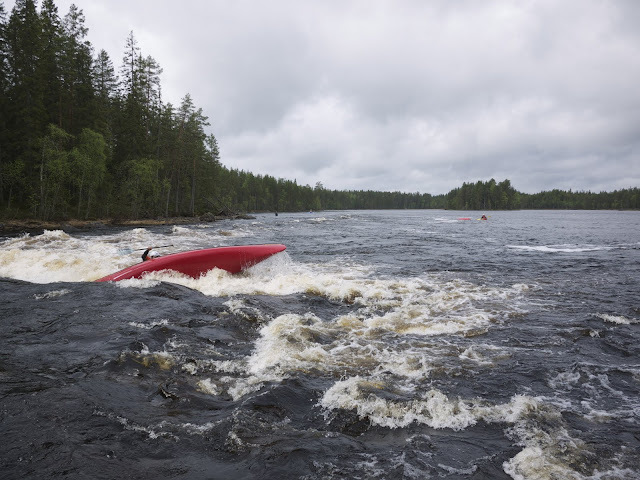 Over the next few rapids - Kattilakoski, Murrookoski and finally Siikakoski - people started to shiver, lose motivation and concentration and hence we had quite a few more capsizes. My stern paddler and me, well, we had a few more miraculous saves from near-capsizes, conversations which are too foul to write down here (What happens on the river, stays on the river!) and picked up a few more paddles, canoes and swimmers until we made it to the campsite. After this long hard day, paddling on a big river, we all went off to our shelters, switched into dry clothes and grabbed our cooking gear to head back to the common fire, where everyone was cooking while we discussed the day gone by. Preparation for the final day. The day that my classmate and me would be daily leaders. 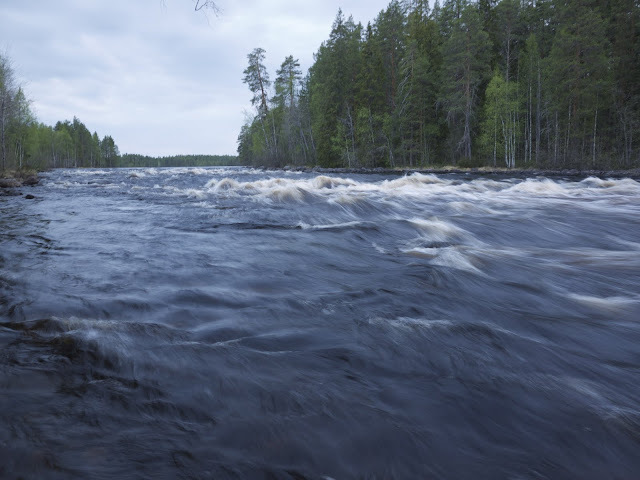 The end of the Siikakoski rapid. On the right side by the yellow speck (its a rowboat) was our camp. Everyone grabs the gear and we drive off to Neitikoski, where the hikers started their day trip back to camp while the paddlers try their luck against Neitikoski again and then continue to paddle to camp. My daily leader partner, an additional driver (as I don't have a driving license) and me stay with with the cars and organize the afternoon and evening programme. With watching the paddlers try their luck over Neitikoski (only one who made it over it!) 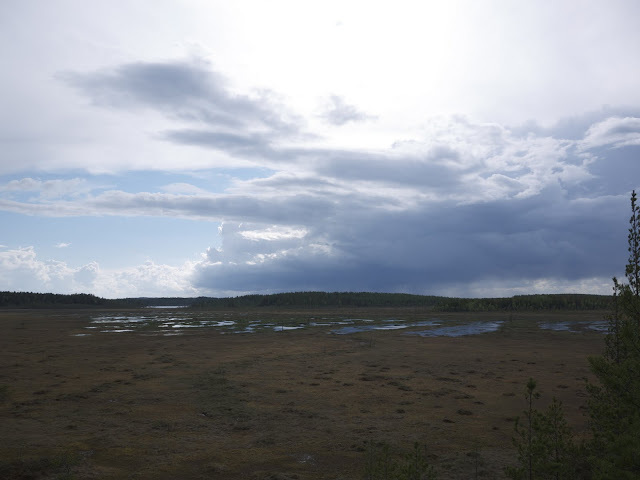 and checking with them that they're OK, we head of to the nearby Nature Centre to pick up the key for the Sauna, have a look at the exhibition, a coffee and pulla before checking out a nearby bird watching tower. Back at camp I start a fire and not too soon at all, as the paddlers already arrive. They didn't take a lunch break and paddled all the way down, and hence are happy about the fire and being able to eat now. 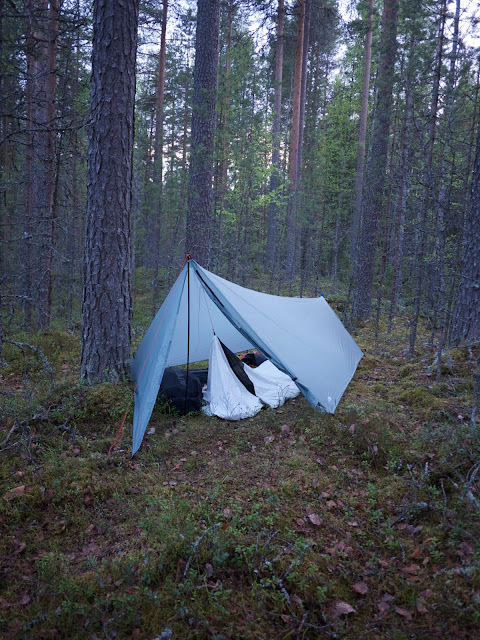 I check with Petri if it is OK for me to wander off and do Siikakoski in my packraft, on my own. Permission granted, I wander the 1,5 km up, inflate, motivate, put on my helmet and PFD and jump in. An interesting ride, and very different from the previous ones: Deep haystacks with headwind mean I need to give 110%, leaning forward and paddle strongly to not flip over and capsize. In the end I make it without problems, and even was able to practice a bit of eddy hoping and ferry gliding in the Alpaca. 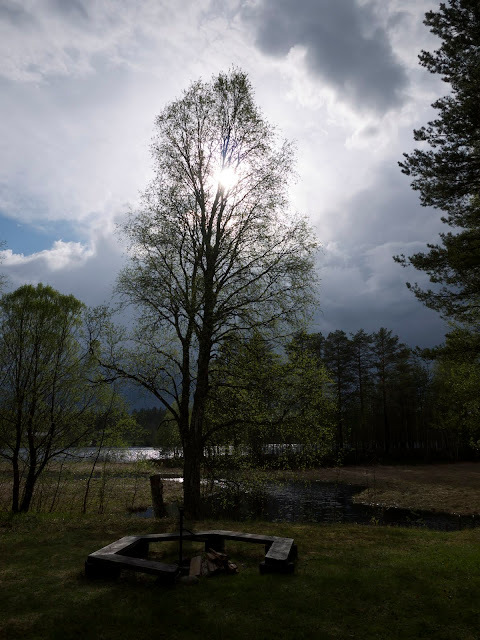 I arrive with a smile on my face back at camp, around the same time that the sun is making an appearance. 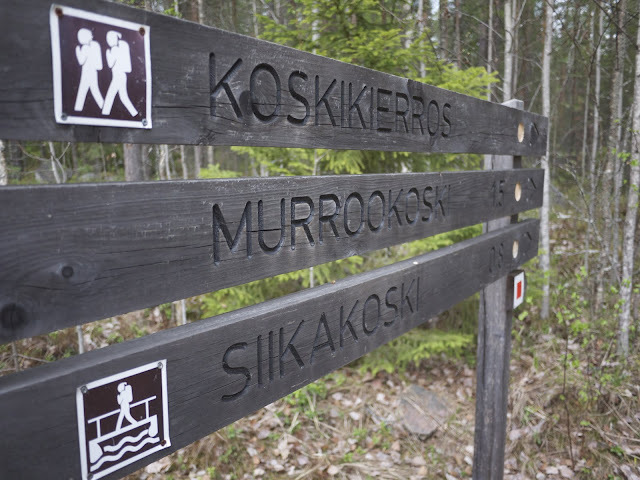 A tad later our hikers arrive, and with the clients gathering their sauna gear we set off in the cars. 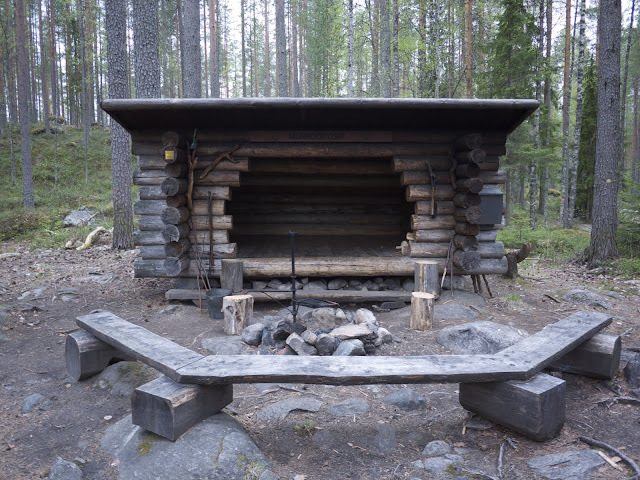 We drop off my daily leader partner to start heat the sauna while I take the "clients" to a nearby bird watching tower at the Reposuo mire area, and after having a look around we head back to the warm sauna. Ladies first, men next (men just need a lot longer in sauna =), sausages, pancakes, banter, a rain shower, sunshine, happiness. 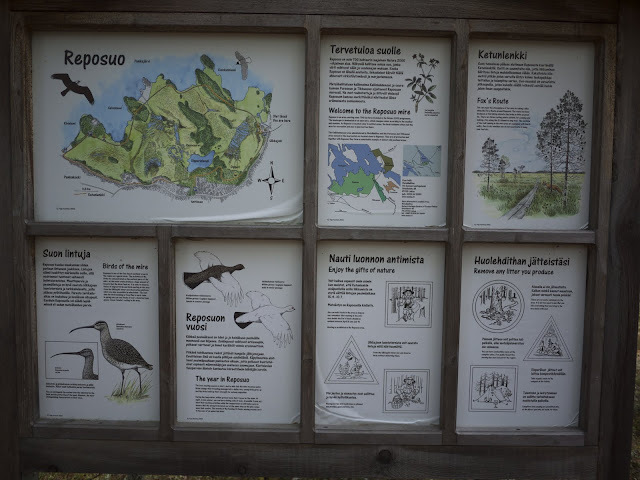 Reposuo info board and part of the mire. We get feedback on our daily leader performance, which was largely positive though a comment came up that none of us two daily leaders where actually with the "clients" but that on the other hand it would not have worked any other way. Everyone is happy, pancakes are shared and after that we leave the sauna and head back to camp. A final fire, instructions for the next day, and we head of to bed. The next day is getting up at 6.30 o'clock, packing, breakfast, loading the car and heading back home. A way too long nine hour drive and we're back in Kuru, unloading personal gear and heading soon after to the local pizza & beer joint! Basecamp the last three nights. Last morning - time to head home! So that was the final expedition-like trip of the Kuru International Wilderness Guide school, and in my opinion the best one. Responsible for that is largely Petri, who was an excellent teacher and who made paddling fun, interesting while also on land disclosing some useful tips & tricks for us Wilderness Guides to-be. And of course, for me personally, for being so cool and supporting with the packrafting - not a given, and very appreciated. Reflections then? Well, canoeing is fun. While UL principles are not super necessary (canoes can carry plenty of gear without much influence on how the canoe runs), I think they allow for nicer paddling if you're lightly loaded. Paramount to good paddling is good communication and a similar paddling style - I only had that with one person, communication was perfect: It was without words. Whatever my action in the bow, I knew my partner in the back would do the corresponding strokes, resulting in a perfect paddle, be it on a lake or down a Class II+ rapid. Without a good partner canoeing is still fun, but adds a bit of unneeded stress - thoughts like "Will he/ she jump ship/ get nervous/ remember the right strokes/ clamber the railing?" will go through my head, and that's stuff I don't need. Kayaking is fun as well. It is fast - I imagine 60 to 80 km days under fine conditions are no problem, given that you're starting early and paddle late. Navigating the seakayaks on rapids was "meh" and I am not intending to do that again; however, play kayaks and white water kayaks like the red one next to my packraft above should be fun on rivers. Problem of both canoe and kayak is that they are made for paddling, and not hiking & paddling (let alone cycling). That is fine if you want to paddle, but is a problem if you want to combine different activities. Yeah, portage is possible, but doing any serious distance with carrying/ pulling such a vessel on a trolley is not possible. Which brings us to the packraft. The perfect vessel for hiking AND paddling (AND cycling). Very forgiving on white water - it was by far the easiest vessel to run rapids with, and a lot more fun. But forget paddling lakes, especially if it is windy - that's where you roll it up, strap it to your pack and walk. It probably looks a lot more dangerous, (my teacher kept on referring to it as a "playboat" whereas Petri saw the options it opened for combined activities) but given that you're alone and it being a very forgiving vessel, I think even complete novices will find running up to Class II rapids no problem in it, and once you have experience even Class III and IV should be no problem - with and without a load. The packraft is pretty hard to capsize. I didn't yet once capsize in one, and a good friend, who paddles a lot more canoe & kayak, had a very hard time to capsize in it (he managed it in the end =). 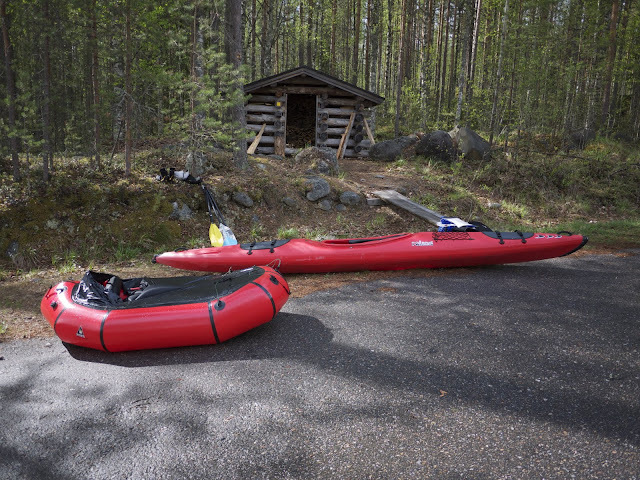 However, going down those deep haystacks at Siikakoski, with headwind, I realized that if you just sit back and paddle in a relaxed way, capsizing is definitely possible and will happen. You need to concentrate, and you need to know how to read waterways. 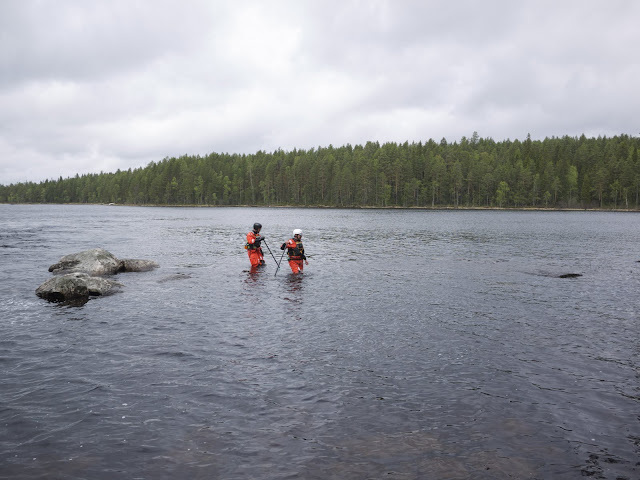 If you have gained that experience, then complete new adventures open up to you, in which you for a weight gain of some 3,6 kg (Packraft including a spraydeck and a paddle) gain endless new opportunities to explore and experience nature.